BLACK EMERGENCY MANAGERS ASSOCIATION INTERNATIONAL: $$$ Haiti. Digicel Foundation Grants. Application period passed. $$$ Haiti. Digicel Foundation Grants. Application period passed. It feels like so long ago when the Digicel Foundation’s Patron and Chair, Denis O’Brien, came to Haiti to celebrate a first of many accomplishments, the inauguration of a school constructed in Thomazeau. Never forgetting the gracious welcome and generosity of the people of Haiti, a commitment was made—to join forces with likeminded local leaders and organizations to strengthen efforts in building a resilient Haiti. For 11 years, the Digicel Foundation has dedicated its resources to serve the most marginalized communities and to address numerous pressing issues.Committed to the vision of transforming lives both through sensible corporate responsibility and community development, the Digicel Foundation began a journey in accomplishing an unprecedented record of objectives, surpassing any other corporate charitable organization in Haiti. Today, approximately 1.2 million men, women and children have benefitted from upwards of 171 community projects. More than 60,000 students have access to quality learning spaces at what will soon be 178 schools built by the Foundation. Furthermore, 2,000+ schools directors and teachers have received professional development in improving the quality of education in primary schools. The determination and drive of the Haitian people, without a doubt, have always served as the Foundation’s inspiration to stay the course in becoming a pioneer and leader in community development. Through the first 10 years, the Digicel Foundation embodied a key value to stand behind communities to change lives. 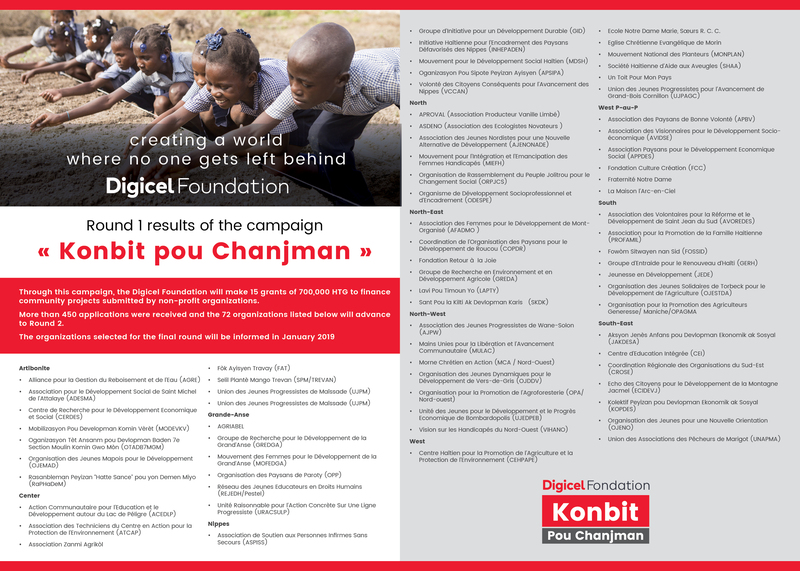 Thus, the Digicel Foundation is pleased to present the second edition of Konbit Pou Chanjman (Come Together for Change) campaign, its newest undertaking to promote more sustainable communities. The initiative seeks to award 15 organizations, 700,000 gourdes each to implement a proposed community project in one of the 10 departments in Haiti. Organizations which seek to fulfill a project in their community were invited to apply for a grant in the following areas: education, culture, inclusion, livelihoods, access, and disaster prevention. The application deadline was August 8th, 2018 and was postponed to August 31st, 2018. The review process is now closed and organizations selected to advance to round 2 were notified on September 14th, 2018 instead of September 12th as originally planned. Click on Round Two Organizations to see the list. For more information concerning the campaign, please see the Konbit Pou Chanjman FAQ.